He makes you happy… He has your affection… And you hope you will never be separated. That’s true love. Or, at Stolk Flora, Real Love. Real Love is the name of a unique concept, a concept to fall in love with: an arrangement of two Phalaenopsis orchids in a decorative duo-pot. Beautiful to have, and even more beautiful to give to the one you love. Stolk Flora provides the Real Love in an exclusive wrapper with Real Love label. 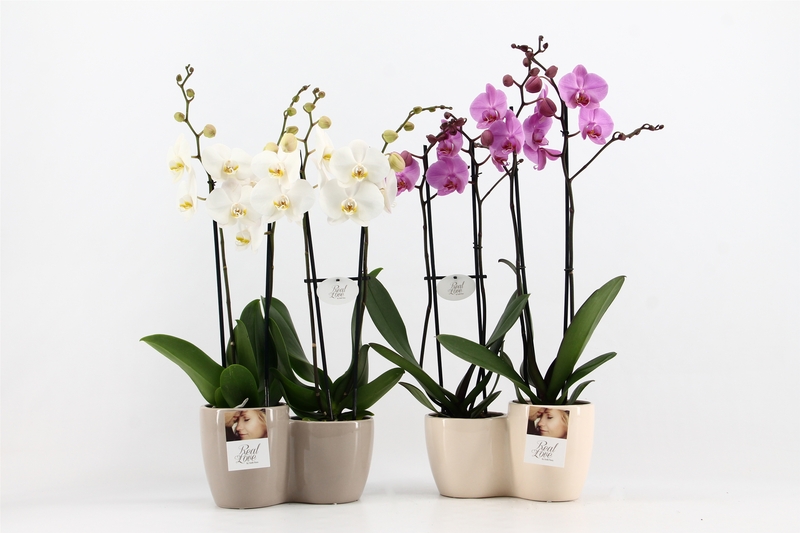 The duo-pot was specially designed for Stolk Flora, with an extra-large pot size of 12 cm to hold a large Phalaenopsis and a smaller matching plant. Together they produce more than 30 beautiful flowers. The duo-pot is available in vanilla and beige-taupe to harmonize with any colour from our Phalaenopsis range.